Night view of Shirakawa-go, a traditional Japanese village showcasing a building style known as gasshō-zukuri. English : Night view of Shirakawa-go, a traditional Japanese village showcasing a building style known as gasshō-zukuri. English : In this animation the external and internal anatomy of a dorada marked with their names is shown. The Paris Town Hall, after the great fire of the Commune in 1871. English : The Paris Town Hall, after the great fire of the Commune in 1871. Diagram of the internal structure of Ganymede. English : Diagram of the internal structure of Ganymede. English : Carnival procession on Avenida del Saladar, Morro Jable, Pájara, Fuerteventura, Canary Islands. Pol-e Dokhtar Bridge, Meyaneh, Iran, by Eugène Flandin, 1840. English : Pol-e Dokhtar Bridge, Meyaneh, Iran, by Eugène Flandin, 1840. Temple of Friendship in Pavlovsk Park in Saint Petersburg. English : Temple of Friendship in Pavlovsk Park in Saint Petersburg. English : Distribtion of food donation 1945 (reenactment). Aircraft Rescue Firefighting training (U.S. Marine Corps). English : Aircraft Rescue Firefighting training (U.S. Marine Corps). English : Extract from the public address of the German Emperor Wilhelm II "To the German people", 6 August 1914. "So now the sword must decide. In the midst of peace, the enemy attacks. So, rise up! To arms! Any dithering, any faltering would be treason to the Fatherland." English : Common Kingfisher (Alcedo atthis). Ferronor GR12U 412 on the gradient between Montadon and Codelcos Potrerillos plant, Chile. English : Ferronor GR12U 412 on the gradient between Montadon and Codelcos Potrerillos plant, Chile. Indian streetseller hands displaying green chickpeas. English : Indian streetseller hands displaying green chickpeas. Cologne Cathedral at night in Köln, Germany. English : Cologne Cathedral at night in Köln, Germany. English : The phase and libration of the Moon for 2014, at hourly intervals. Includes supplemental graphics that display the Moon's orbit, subsolar and sub-Earth points, and the Moon's distance from Earth at true scale. English : A Drilus “L” larva (in the lab) creating an exit bore-hole from within a prey Albinaria meleaus, followed by stills from the lengthy procedure by which the larva emerges from the shell. Mongolian gerbil (Meriones unguiculatus) in Wilhelma Zoo, Stuttgart, Germany. English : Mongolian gerbil (Meriones unguiculatus) in Wilhelma Zoo, Stuttgart, Germany. English : Urilift by Kungsportsplatsen in Gothenburg. It is a pissoir that is lowered in the ground during the day, and can only be used at night. This broad panorama of the Carina Nebula, a region of massive star formation in the southern skies, was taken in infrared light using the HAWK-I camera on ESO’s Very Large Telescope. 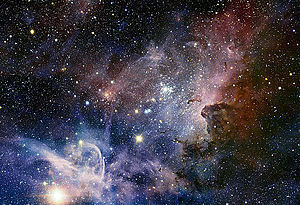 English : This broad panorama of the Carina Nebula, a region of massive star formation in the southern skies, was taken in infrared light using the HAWK-I camera on ESO’s Very Large Telescope. English : A popular 19th-century brass band arrangement of the Hunters' Chorus, from The Rose of Erin, also known as The Lily of Killarney (1862). English : Crystallization of aqueous potassium permanganate KMnO4 solution on ceramic surface due to evaporation at room temperature. English : Le Voyage sur Jupiter is a French silent film directed by Segundo de Chomón in 1909. French actress Sarah Bernhardt, by Félix Nadar, around 1864. English : French actress Sarah Bernhardt, by Félix Nadar, around 1864. English : Berako inude eta artzaiak (Nursemaids and shepherds of Bera) is a festival during the carnival of Bera, a village in Navarre. Girls from the village play shepherds, and boys play nursemaids. The tungsten filament burning with a flame in the light bulb. English : The tungsten filament burning with a flame in the light bulb. English : Common ringed plover (Charadrius hiaticula) on nest. The VLT Survey Telescope (VST) at ESO's Paranal Observatory in Chile has captured this richly detailed new image of the Lagoon Nebula. English : The VLT Survey Telescope (VST) at ESO's Paranal Observatory in Chile has captured this richly detailed new image of the Lagoon Nebula. English : Southern shore of Aura river in Turku between Föri cabel ferry and Martinsilta and Myllysilta bridges. Video taken from river ferry Jakke. Dark giant horsefly (Tabanus sudeticus), taken at Fronton, Haute-Garonne France. English : Dark giant horsefly (Tabanus sudeticus), taken at Fronton, Haute-Garonne France. English : The exterior of Landeshaus in Kiel. English : Spring rose (Helleborus orientalis). English : The Evidence of the Film is a 1913 American silent short crime film directed by Lawrence Marston and Edwin Thanhouser starring William Garwood. Deutsche Bank Twin Towers, headquarters of Deutsche Bank in Frankfurt am Main. English : Deutsche Bank Twin Towers, headquarters of Deutsche Bank in Frankfurt am Main. English : An excerpt from a film showing the courtship rituals of the Heath hen (Tympanuchus cupido cupido), which has been extinct since 1932. English : Two single-celled Vorticella on the root of duckweed. One Vorticella is clearly trying to feed itself by capturing smaller, swimming organisms. Audience hall of Odessa Opera and Ballet Theater in Ukraine. English : Audience hall of Odessa Opera and Ballet Theater in Ukraine. English : A Škoda 7Ev departs from Hradec Králové station (Czech Republic). English : All Saints Church, Odiham. Macrocranion tupaiodon; Eocene, Messel, Germany; Staatliches Museum fur Naturkunde Karlsruhe. English : Macrocranion tupaiodon; Eocene, Messel, Germany; Staatliches Museum fur Naturkunde Karlsruhe.